Hornfels. (Ger. Hornfels = horn rock). Hornfelsed greywackes and shales, bedding partly preserved, Le Pulec. Hornfels is the name given to a metamorphic rock which is massive, finely crystalline and very compact, consisting of equidimensional anhedral crystals of recrystallised clay minerals from shales. This occurs by contact (thermal) metamorphism usually by an adjacent igneous intrusion (Allaby & Allaby, 1990. p. 266). 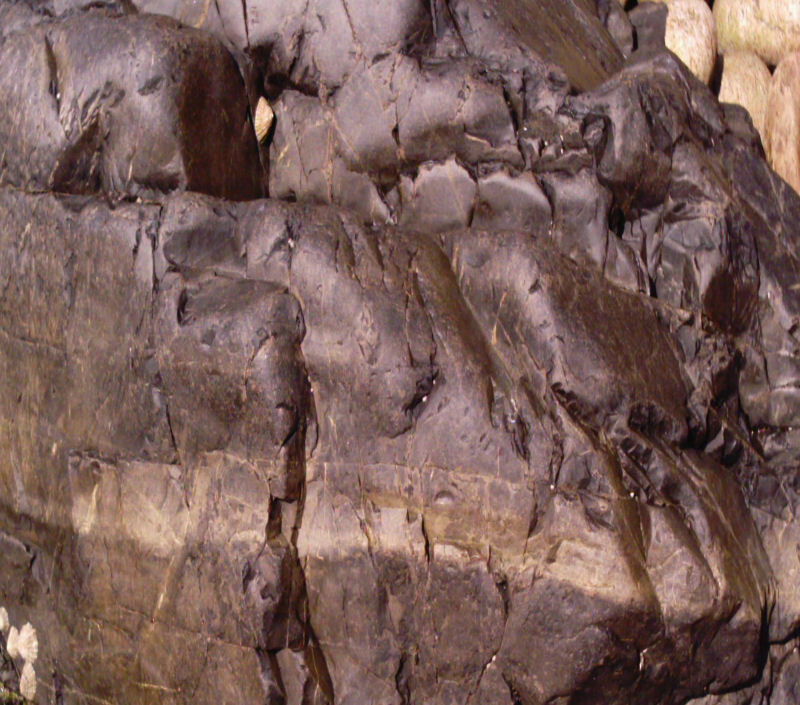 In Jersey, hornfelses occur in the Jersey Shale Formation in the aureole adjacent to the Northwest Igneous Complex at Le Pulec Cove near L'Étacq. They are easily seen in the shale and siltstone on the right and left hand sides of the slipway down into the cove. Hornfels, laminated 'shale' Le Pulec. Here, c. 100m from the granite, the bedding is still clear and the dark grey former siltstones which dip north east towards the granite, are are not only hard and compact but are now spotted. Further southwest towards La Bouque fault, the aureole is wider and the rocks are cordierite-biotite hornfelses with chlorite spotting (Bishop & Bisson,1989, p. 8.). The authors also record alterations in the aureoles around the other granites, eg. 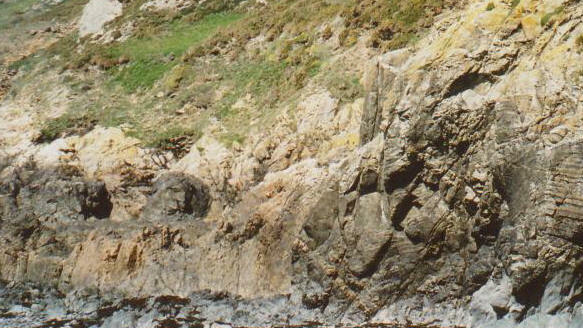 to the shales near La Pulente at the southern end of St. Ouën's Bay, while in Gorey Harbour shales have been altered to a hornblende hornfels, and at the northern end of St. Peter's Valley the conglomerates within the shales contain biotite and are spotted with chlorite. Allaby, A. and Allaby, M. 1990. A Dictionary of Earth Sciences. 2nd. Ed. Oxford University Press.